With the passage of time all things come and go, and none more so possibly than publications and magazines. What we all read today - in 40/50 years or so from now - will become 'historic' and out-of-print; yet being able to read them again today one finds those same publications and articles hold a great deal of fascination for us flying boat enthusiasts about how things were at the time they were published, the technology and the issues faced. Today, we all know how it happened but back then there were real challenges and reading their thoughts at the time is fascinating, together with the 'live' stories of flying boat adventures as the 'envelope-was-pushed', as they say. 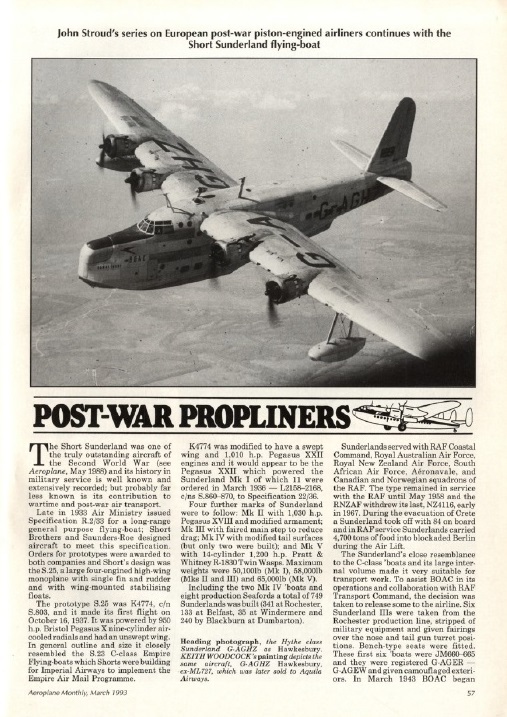 These articles are a wonderful source of photographs, drawings and details long ago consigned to the waste bin, for us modellers and enthusiasts. With this gallery, I have attempted to save for posterity those articles from certain publications that are today long-out-of-print, yet are worth saving so that future generations have the ability to read what it was all about, written at the time it occurred, and thus gain an idea of what it must have read like, at the time. 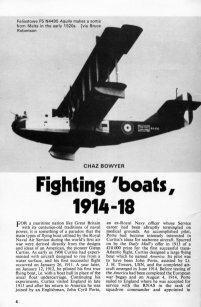 If you have access to any old flying boat articles, please consider sending scans into SEAWINGS for inclusion here. Credits: Grateful thanks to Andy Doran, the late Brian Knock & John Barlow for their assistance in compiling this gallery. 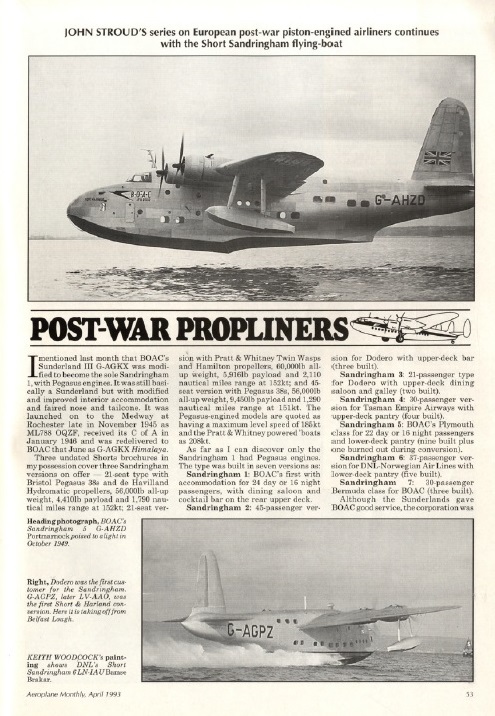 One of the few original Profile Publication booklets that featured flying boats, part of the huge series that was so very popular in the 1970's. A superb read. 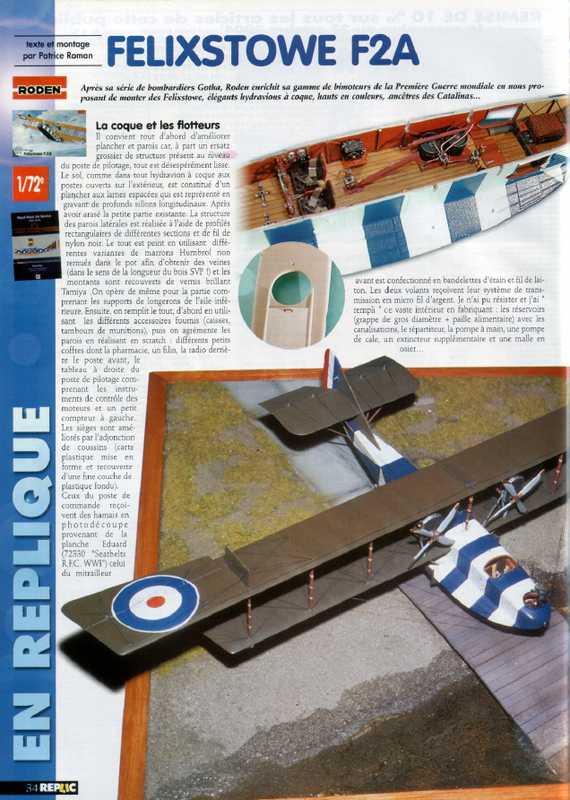 Article from this popular American magazine discussing the - then - latest features of flying boat developments. An informative article showing how large scale radio-controlled models were used to assist data gathering during the late '40's. 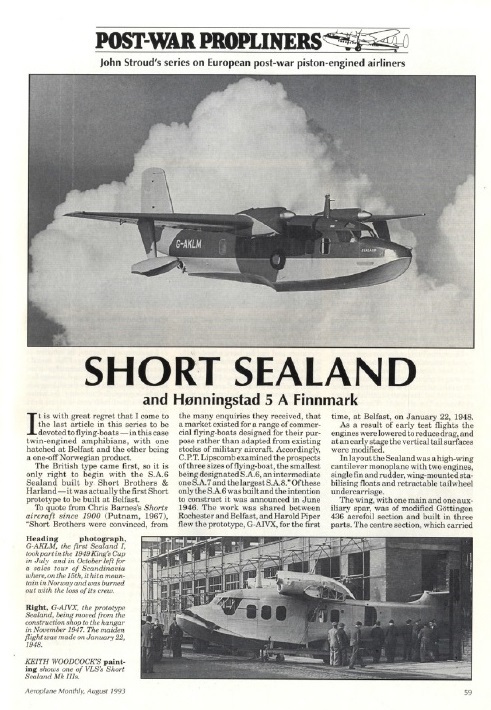 Well written article featuring details of the record distance flight of the remarkable 'piggy-back' flying boat and seaplane combo. 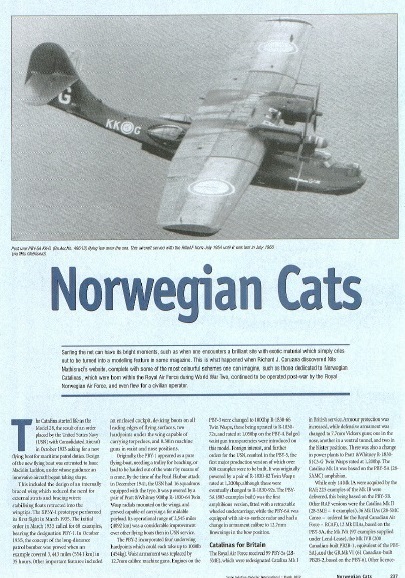 This article tells the story of the long - non-stop - trans-Atlantic flight of the first Catalina delivered to the MAEE at Felixstowe. 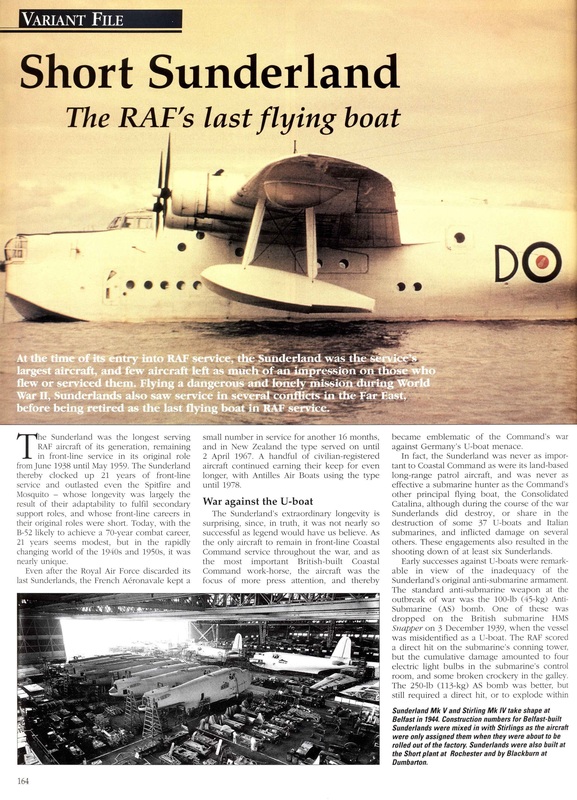 This article was the first look at the then new huge RAF flying boat for the aviation enthusiasts at the time, with superb drawing sketches. 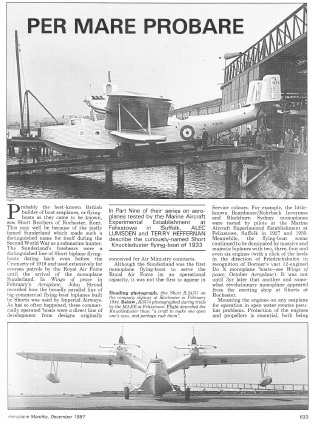 This article is a close look at the, then, new RAF flying boat from Supermarine complete with interior photographs. Detailed technical appraisal of this craft with photographs - including the interior - plans and drawings. Very interesting article written by the Works Manager of SARO detailing their build-up to mass production and the issues involved. Narrative with drawing and photographs of 'Mercury's record-breaking flight across the Atlantic. Superbly detailed article with drawings and photographs describing fully what was involved in these trans-Pacific flights. 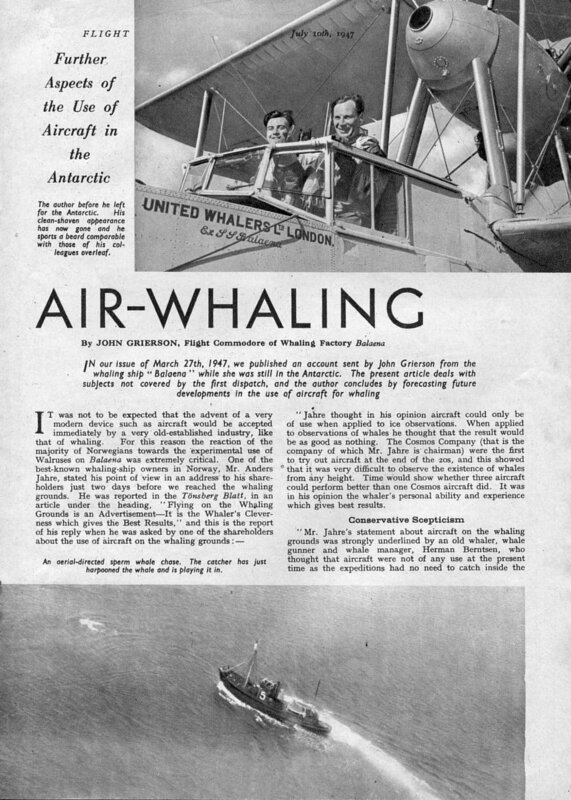 Superbly written article with photographs describing the now defunct 'art' of whaling by spotting from the air using Supermarine Walrus's. Story of Spain's use of the ubiquitous Dornier Do.24 in the S.A.R. role. Complete detailed descriptions of all the many variants of the Sunderland and Squadron's together with drawings and photo's. Detailed article by Steve A. Evans describing his build review of the Italeri 1/72 scale plastic kit with tips and techniques. Detailed article by Mark Schynert describing his build review of the Sword 1/72 scale plastic kit with tips and techniques. The first photographic look at the B-314 Clipper 'Bristol' on lease-lend to British Overseas Airways in FLIGHT. 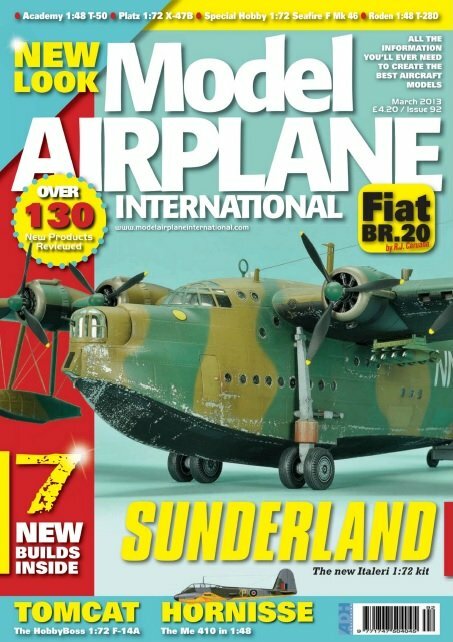 Superbly detailed article with first-class colour side & top profiles of Norwegian operated WWII PBY Catalina's by Richard J. Caruana. Another detailed article in the 'Post-War Propliners' series, this one featuring the Short Sandringham by John Stroud with artwork by Keith Woodcock. 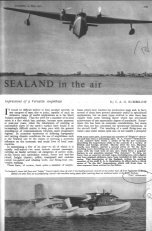 Another detailed article in the 'Post-War Propliners' series, this one featuring the Short Sealand by John Stroud with artwork by Keith Woodcock. Part 9 of the series 'Pro Mare Probare' featuring aircraft flown and tested at the M.A.E.E. Felixstowe by Alec Lumsden & Terry Hefferman. 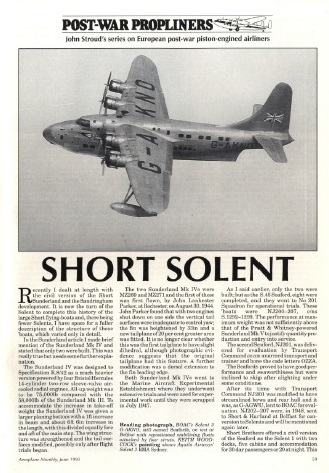 Another detailed article in the 'Post-War Propliners' series, this one featuring the Short Solent by John Stroud with artwork by Keith Woodcock. Another detailed article in the 'Post-War Propliners' series, this one featuring the Short Hythe class & Mk.III civil by John Stroud with artwork by Keith Woodcock. Very detailed article with excellent drawings and photo's featuring a rare look at the internal structures. The complete and very detailed story of the design and development of the Felixstowe flying boat series by renowned author J. M. Bruce M.A. 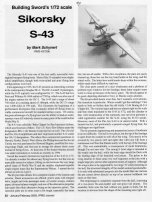 Highly detailed article for modelers - with plans - by C. Rupert Moore, A.R.C.A. Story of the design and use of sea-borne towed lighters to transport WWI flying boats including the Felixstowe F.2A. Fascinating stuff for diorama buffs. 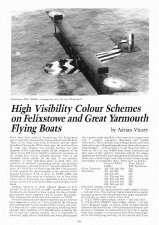 Superbly detailed article by the late Ken Molson covering the design and construction of the F5L, the later development of the Felixstowe F.2A. 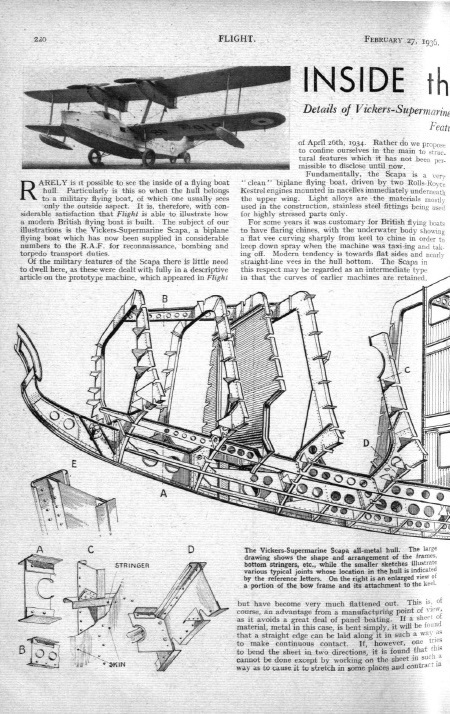 Useful for interior photo's and general guidance for details of the F.2A. 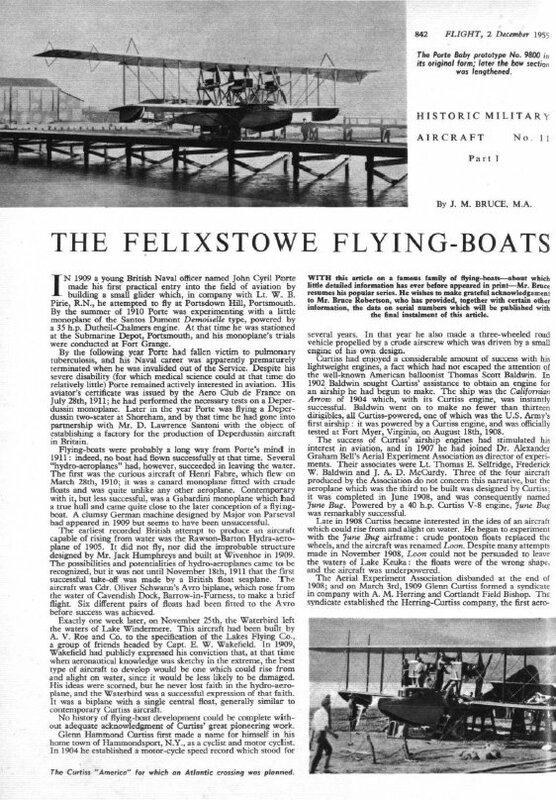 Concisely detailed article by the late Chaz Bowyer covering the design and operations of the Felixstowe and Curtiss flying boats during WWI. Useful for general guidance on the types. In the case of the Felixstowe F.2A archive my grateful thanks goes to: Andy Kemp, Chairman, Cross & Cockade International, Flight magazine, and authors Adrian Vicary, Michael H. Goodall, the late J.M. Bruce M.A. and the late C. Rupert Moore A.R.C.A. together with correspondent Alex Norton for their generous help and assistance in this particular archive. Bill Mortimer is an original time-served flying boat 'Web-Foot', having actually worked on various types of flying boats whilst based in their latter years at the M.A.E.E. (Marine Aircraft Experimental Establishment) at Felixstowe, and still blessed with an intense interest in anything connected to the genre. In a series of fascinating articles written by him and published in now sadly out-of-print magazines from years ago - now long-since forgotten by most - Bill described in detail what it was like. 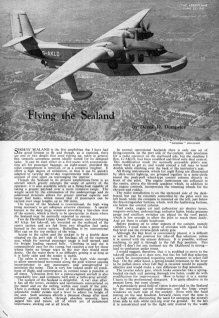 SEAWINGS is privileged to re-present those articles in their entirety, scanned as pdf's for you to download so that today's flying boat enthusiasts can to learn what it was all about. Our grateful thanks goes to Bill for his kind permission to present his articles here. Thanks, Bill. The unique and fascinating story of the proposal, design and eventual trial fitting of two-man torpedo chariots to operational Short Sunderlands, complete with photo's and drawings. The story of the development of the Short Seaford from the original Sunderland. How it was done at Felixstowe; Launching, Mooring, Beaching and working on and around the 'boats. Interesting details of the final days at one of the most iconic flying boat testing bases ever; Felixstowe. 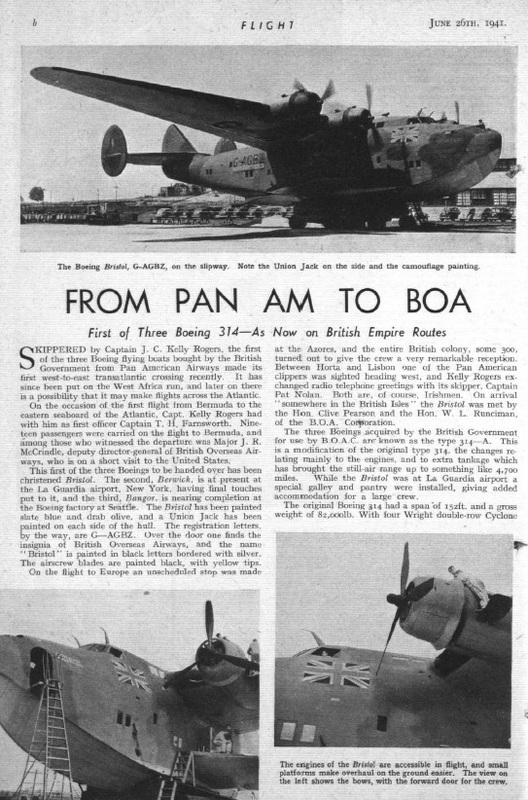 The fascinating tale of flying a Short Singapore 'boat half-way around the World, in a bygone era. My flight in a Chalk's Ocean Airways Grumman G.73 Turbo Mallard from Nassau, Bahamas to Fort Lauderdale, USA and back.